What do you recommend for the best experience for iPhone users? Use the Native iOS POPin application with your iPhone, available on the Apple App Store. 2. What do you recommend for the best experience for iPad users? We recommend using the POPin Web version either on Chrome, Firefox or Safari. 3. What do you recommend for the best experience for Android users? Use the Native Android POPin application on your Android device, available on the Google Play Store. 4. What do you recommend for the best experience for Desktop users? 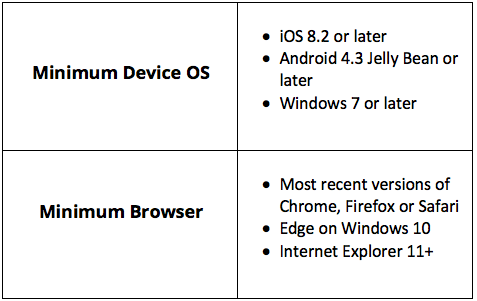 The latest browsers are supported and Chrome is recommended. Other popular browsers being used by our customers: the latest versions of Safari, Firefox, Edge on Windows 10 and Internet Explorer 11+.